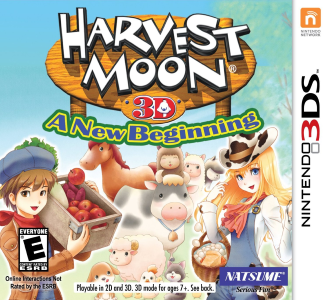 Harvest Moon 3D: A New Beginning is a role playing game for the Nintendo 3DS. It was the last title in the Bokujō Monogatari/Story of Seasons series to be released under the "Harvest Moon" name. The game was published by Marvelous AQL in Japan, Marvelous AQL Europe in Europe, and Natsume in North America. Harvest Moon 3D: A New Beginning does not appear to have any graphical issues. Audio seems fine aside from some stuttering. The game runs near full speed with mid tier hardware, but freezes when the first text entry box shows up during character creation.